Where’s your favourite place in Cornwall? Is it those cute little fishing villages, the sociable beaches full of water sports and activities or the hidden gems that no one really knows about? For me, it’s the cliff tops that offer incredible views out onto the Atlantic - the type when if you look hard enough you might spot a pod of dolphins or some kayakers off on an adventure. This Mother’s Day, my sister and I decided to take our wonderful Mumma for a picnic on the cliffs at our favourite place in Cornwall. Treen cliffs are known as the coastline along the Porthcurno and Pedn Vounder area and to me, is one of the most stunning parts of Cornwall. The cliff edge has been beaten during previous storms and has been left with orange/red tones alongside the colour of the sea which is always so turquoise due to the white sands beneath. Every time I come to Treen Cliffs I always find something new. We packed our bags and threw on some sensible footwear, ready to embark on a hike along the cliffs. Pedn Vounder is a small (oh, and nudist) beach just around the corner from Porthcurno - fortunately, I know a fantastic spot on the cliffs that provide views over to Logan Rock in one direction and the Minack Theatre in the other. The climb down to Pedn Vounder beach is incredibly steep so please only visit if you’re capable - please note that there is little phone signal and the area isn’t watched by a lifeguard - we don’t want anyone plunging to their deaths so please do be sensible (I’m not even exaggerating). We parked in Treen Carpark and walked along the coast path until we came to the wild ponies - I’ve visited these guys a few times and they’re always so happy to see people. Treen Cliffs is an adventurers paradise. 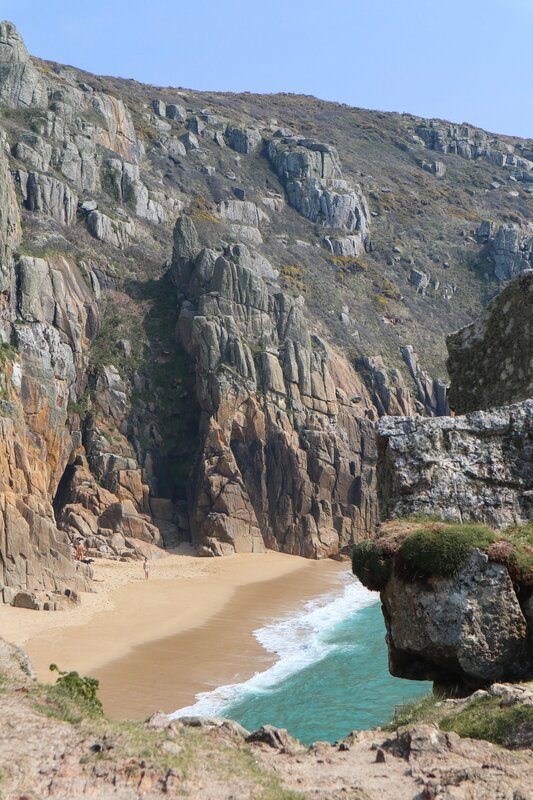 Either head down to Pedn Vounder, around to Porthcurno and the Minack Theatre or over to Logan Rock. I’ve yet to climb over to Logan Rock but I am intrigued to see what is on the other side - that’s an adventure for another day. It was very hazy at the top of Treen cliffs but it began to get clearer as we got closer to sea level - if anything, the haze made the views look like we were actually on a tropical island rather than the UK. There are so many spots along Treen Cliffs that are protected from the wind - perfect for a picnic or just to sit back and relax whilst watching the white horses roll in. Treen really is an outstanding area of natural beauty and I feel so lucky that these places are on my door stop.